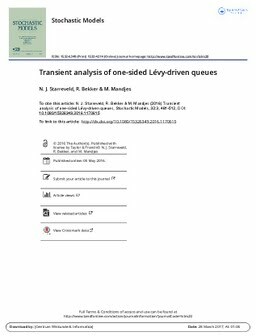 In this article, we analyze the transient behavior of the workload process in a Lévy-driven queue. We are interested in the value of the workload process at a random epoch; this epoch is distributed as the sum of independent exponential random variables. We consider both cases of spectrally one-sided Lévy input processes, for which we succeed in deriving explicit results. As an application, we approximate the mean and the Laplace transform of the workload process after a deterministic time.